Steak is one of those foods that must be seasoned carefully so that its flavors are preserved. Careful seasoning is especially important if you are dealing with a higher grade of meat. Usually, simplicity is the best option. You do not want to mask the flavor of a Prime or Choice steak with a heavy coating of spices. Many purists actually recommend that very high quality steaks should not be salted at all before cooking. Instead, the salt should be applied only after it is removed from the grill. When doing this, you will want to use the best salt for steak to maximize your enjoyment of the meat. Crystal size is the most important factor when choosing the best salt for steak. 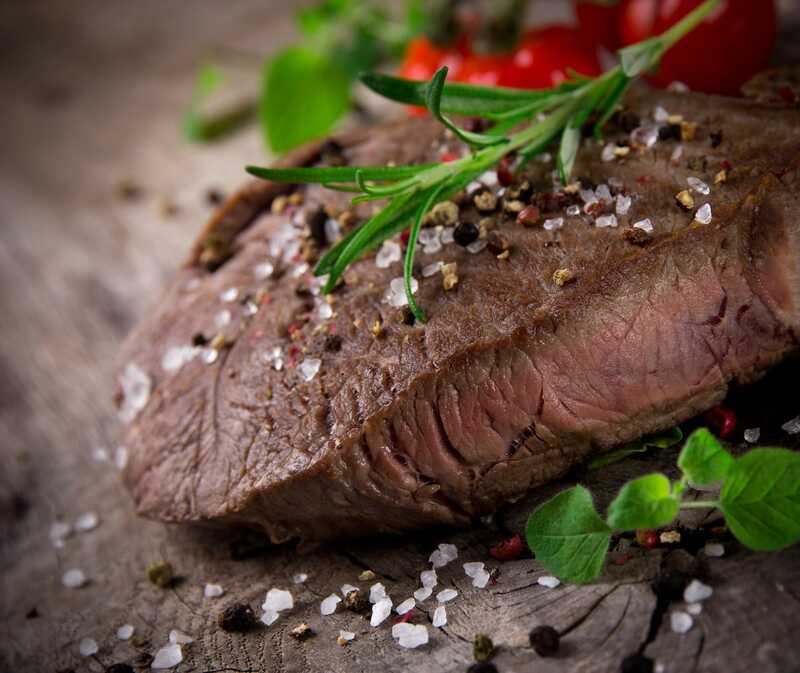 Larger crystals are best for salting steaks since they do not dissolve as quickly. Finer crystals dissolve quickly once applied to the meat’s surface. This means that salt with large crystals can keep you from getting your steak too salty since they will linger on the surface without breaking down. Table salt and other salts with fine crystals will dissolve almost immediately and soak into the meat. This results in an over-salted steak. Kosher salt is arguably the easiest large-crystal salt to find and is sold in most grocery stores. Not only will it take time to dissolve, it does not contain iodine. The absence of iodine ensures a clean saline flavor with no bitter aftertaste. Along with its large crystals, this salt has an appealing color that can help to enhance your presentation. Like kosher salt, Himalayan pink salt is iodine-free ensuring that the only thing flavoring your steak is the salt. One popular method of steak involves cooking it on a block of Himalayan salt. Contrary to what you might think, this does not over-salt the steak. Rather, it gives it a mild saltiness that is far from overpowering. Cook your steak on the salt block by heating it over your stove’s burner and placing the steak on top of it. This is salt that is harvested from ocean water rather than mined from the ground. There are large and small crystal varieties. The large crystal sea salts that best complement steak include dry salts like Maldon sea salt and moist types like fleur de sel. Both types provide the desired crystal-size along with a deep briny flavor that complements quality steak. DO time the application of salt correctly. You will want to apply salt right before cooking or several hours in advance. Applying the salt right before cooking keeps the salt from drawing out all the moisture from the meat. Seasoning it well in advance allows any moisture that has been drawn out to soak back in. DO dry your steaks with a paper towel before applying salt if you are salting them right before they go on the grill. This helps them to form a brown crust. DON’T under-salt your steak. This is an easy mistake for inexperienced cooks to make, even with the best salt. What appears to be the right amount of salt based on the surface area of the meat is usually not enough. It is important to keep in mind that most of the meat is below the surface and will not come into contact with the salt.